Villa, single occupant, 3 bedrooms, sleeps 7, large private garden. 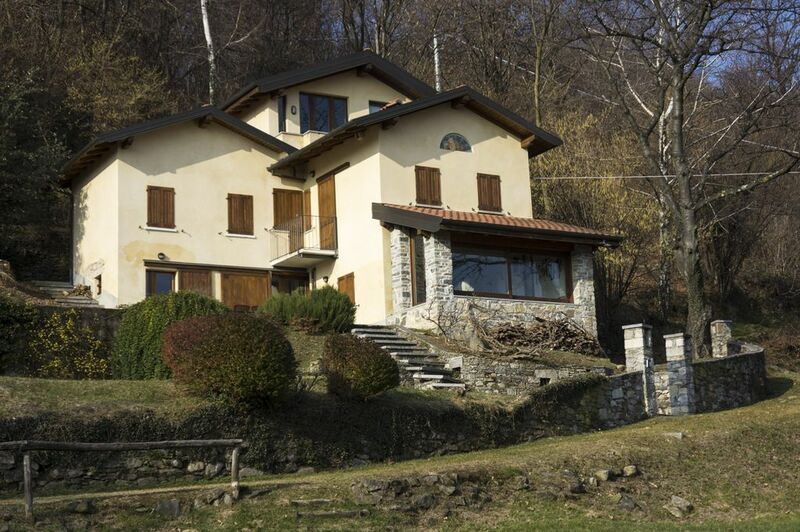 The house is built in the middle of a 20.000 sqm property overlooking Lake Maggiore. A great view in a silent, reserved, exclusive place, with seasonal flowers and fruits, is the key for a relaxing holiday. There is a car park in a large private parking just 50m from the house. Enjoy your stay in this 2 floors, 3 bedrooms, 2 bath rooms property with a wonderful Veranda and a working Fireplace inside and a BBQ on the terrace outside. You can reach the house from Malpensa airport within 35km car drive. Linate Airport and the city of Milano are only 70km away. Wonderful Stresa with boat service to the Borromean Islands is only 8km away. A 18 holes Golf Course is less than 10 minutes away, while Belgirate village and the beach is just a 15 minutes walk in the woods or a 5 min. car drive. What else can you wish for? Just book your holiday now! The Garden: The House is surrounded by 14.000 meters of private woods and garden. A gardener will keep the place clean for you while you enjoy its fruits and its flowers. You can get fresh fruit in the garden almost all the year round.You start in May with wild Asparagus and Morons, in June you have Raspberries and Cherries, in July Nuts and small Pears, Blackberries and Figs in August, Grapes in September and Chestnuts in October and November. For additional pictures, please contact us for web site address. Beaches: In a hot sunny day the best way to spend the warmest hours is swimming in the Lake. The water is fresh and a constant current keeps it clean in Belgirate. If you like to meet other people you can choose the Public Beach which is located at the entrance of the village coming from Lesa. If you like to stay on your own then I suggest you take Via della Masseria which starts few meters above the end of La Bargajana road. It is a little steep with 3 tight turnpikes but it is paved and takes you directly to the lake (by the way this is the fastest way to Stresa as well!). At the end of Via Masseria Park your car, cross the SS 33 (Sempione Statal Road) and you will see on your left an access to the beach. A big Oak Tree will provide all the shadow you need. If you are looking for a sandy beach a nice alternative is 20 km north in Feriolo or just 2km south in Villa Lesa. A trip by Cable-Car from Stresa to Mottarone mountain top: wonderful view on the Alps and on the Lake. A Car ride to Orta S.Giulio passing thru Il Mottarone: after that v. nice view from Mottarone, you will find a peaceful out-of-it-all atmosphere in Orta S.Giulio. A trip by Boat visiting S.Caterina del Sasso (a nice Monastery in a breathtaking place), Isola Bella, Isola dei Pescatori (nice Restaurants), Stresa and then back to Belgirate! Botanic Gardens. If you like gardening then you might be interested in visiting one of the numerous Botanic Gardens in Stresa, Verbania or Isola Madre. Local Markets. Everyday from 9:00 to 13:00 you have a Local Markets in one of the villages near Belgirate. They might not be large but they are always worth a look! This year you have: Monday/Baveno, Tuesday/Arona, Wednesday/Luino & Sesto Calende, Thursday/Lesa, Friday/Stresa, and Saturday/Verbania. My husband Stefano inherited the house and the surrounding land in 1990 from his father. La Bargajana used to be the farm house of the family villa in Belgirate but it was abandoned since the early 70s. The renewal effort took around five years and since then La Bargajana became our weekend retreat and the place for short brakes all year round. La Bargajana is a unique place, it is isolated in the middle of nature with a wonderful view of the lake. At La Bargajana you are close to everything you might want but you can totally relax yourself and enjoy silence and peace. It is a unique place and we are very happy to see that our guests agree with us! Shower, hand and bidet towels are provided together with bed linen, and Kitchen towels. The living room, with a veranda overlooking the garden and the lake, is equipped with a fireplace, a double sofa bed and a couple of armchairs. the kitchen features an electric oven with timer. We provide 2 standard italian Moka, one small for a single espresso coffee cup, one mid-size for three cups.. We also provide an electric cattle. we provide a welcome set with fresh fruit, Prosecco and Soda. The kitchen is fully equipped with what you need to cook inside and in the barbeque outside, disches, utensils and glasses can easily accomodate 10 people. you will be the only family enjoying a 20.000 sqm property surrounding the house. in front of the house you have a Terrace, equipped for dining outside, with a wonderful view on the garden and the lake. A quiet away-from-it-all place with no neighbours where you can relax but also find a choice of activities and entertainment within an easy reach. In less than 10 minutes car drive you can go sailing, wind-surfing, swimming and all kind of water sports on Lake Maggiore. You can choose between 6 different Golf courses within 30 kms (see Golf Details) or enjoy skiing in winter either on Mottarone or Macugnaga/Monterosa (see Ski details). Tennis is also available in the village (10 minutes walk) while if you like trekking you can start exploring the woods around the house or take a car and explore the pre-Alps and mountains around the lake. Horse riding is available in Magognino (3 Km.). You can enjoy a trip by boat to visit the Borromean Islands, visit the Botanic Gardens of Villa Pallavicino or drive to Orta S.Giulio thru the Mottarone road. Almost everyday you have nice Local Markets in the nearby villages while in less than 1 hr car ride you can go Fashion-shopping in Milano. Nightmare owner and decent place if you dont mind being over run by ants. SO... the owner. I am a travel writer for the major mags.. I was traveling by myself, and after asking three days for the owner to do something about the Ant infestation, a nest had moved into the house. He thought clearly it was not really a problem till his daughter finally came and they realized there was a HUGE problem. And finally set the ant traps as they crawled on me when I slept on the couch and that was the last straw. BUT be prepared to be treated like you are crazy for complaining. On the third day the broken dishwasher flooded and I had to sweep out the water of the whole place. Which he never actually ever did anything about. He tried to double charge me a cleaning fee. I sent him videos of the ants and the flooded floor and broken dishwasher. I actually had to call my Italian fiance to talk to him and get him to understand the severity of the ant issue when I had been bit in my sleep. He really just wants to rent his place to someone who just takes it as is. The location is stupendous, but the neighbors complained about my dog barking and even came onto the property in the morning when I was in my bathrobe claiming that the dog barked all day long and I was never home. Just know what you are getting into with this place. If you have no dogs, know the place is going to have spiders, and ants ( I think during our stay the infestation was taken care of) and you dont have to talk to the owner. I would like to thank you because you kindly recognize that the place is stupendous and that the ants's problem was effectively taken care of. - The house is isolated, and you will enjoy a lot of peace and privacy; but you still have neighbors and if your dog, left alone tied to a tree, barks disperately day and night they will come to see what happens. Having said that, I am very sorry you had such a negative experience of my personal support to you. This is the first time I receive such a negative feedback in 16 years, with more than 60 groups of guests from everywhere in the world, with HomeAway but this will not prevent me from doing my best to improve even further. We stayed in this house overlooking Lake Maggoire for our honeymoon. It was absolutely fantastic. The house is great, well kept, full of character and clean; the huge sliding window in the living room is particularly impressive, opening up half of the wall to the vista of the lake and the mountain air. The views and the sunsets are breathtaking. There are some great walks behind the house too: lovely woods with miles of stone trails connecting picturesque villages and ancient chapels. The owner and house keeper would really nice, too. We were greeted with a bottle of sparkling wine and a bowl of fruit and they were really helpful whenever we had a problem. I'd whole-heartedly recommend this property. The house has tremendous views of Lake Maggiore and the solitude was perfect for a honeymoon. We loved the chestnut wood with its waterfalls and rock pools. The kitchen was well-equipped for self-catering. Friendly welcome on arrival. Please note the climb to the house is very steep and not suitable for anyone infirm. For safety children should be supervised in surrounding land. We all had a really wonderful time here. A quiet location, with the house is set high up on a hillside with a fantastic view of Lake Maggiore and the mountains beyond. A big garden with grill for those lovely warm evenings or an open fire in the living room for when not. We came here for a week of mountain biking (plenty of trails in the area) but also the usual holiday requirements and were not disappointed. The house has lots of character - we appreciated all the personal touches that the owner made. It really felt like being in the home of a friend - so high compliments indeed. Settings wonderful, house very comfortable. Fantastic garden, especially if you travel with a dog. Kitchen / dining area great. -Cleanliness!!! When opening the drawers and cabinets in the kitchen, you quickly understand all ustencils, pots, pans, cups, plates cutlery need thorough cleaning before use. The bottom of the drawers and cabinets is never cleaned. - Lack of wifi. These days, for such a house, wifi is not an option anymore. I am managing a B&B/hostel in Brussels. Internet access/WIFI is part of any modern traveller. I needed access for professional needs, and this caused me big big problems. - Airconditionning in the bedrooms would be more than welcome. This house heats up very fast. - lack of presence in English , capable of helping guests with specific questions about tourism, dining, access to activities, technical issues...etc....gives a very impersonal feeling. Owner is 'far" away. Meeting new guests when they arrive doesn't seem to be important. La Bargajana is a cosy country cottage, surrounded by a large private property, isolated in the middle of nature. Come for the comfortable house in a wonderful setting with a great view and you will get it! The end of the road to access to the house is not very easy ( rocks and very stiff). A additionnal bathroom would be perfect,if your are more than 4 people !, and please change the vaccum cleaner which is out of order ....You may also add a toaster. We keep a good memory of this house and of the area! We try to improve La Bargajana every year with new works or piece of forniture, following advice from our guests. In 2012 we added a new vacuum cleaner, as suggested by our guest, and a new sofa bed in the veranda. More improvements will come as we move forward! Belgirate is a small, nice, 400 people village on the west coast of Lake Maggiore mid way between Arona and Stresa. In Belgirate you can find basic shopping: a small supermarket, a news stand, pharmacy, a couple of good restaurants and bars. Belgirate has a Railway Station and a Ferry Boat Station. In Belgirate and around you can find several nice beaches. Belgirate has a Boat Rental facility and a Diving centre. In Lesa (2Kms) there is a Sporting Club with a nice pool, tennis and other sports opportunities. A lot of sightseeing opportunities are very close: the Borromean Islands, the Park of Villa Pallavicino, the Mottarone Mountain, romantic Lake D'Orta, etc.For shopping you can drive to fashionable Stresa or Arona, both are 8 kms away while Milano is only one hour (70 Kms) car drive. All year round there are nice, colourful local markets in the different villages along the lake shore and several local festivals with lot of folklore to celebrate seasonal events. Golf: There are 8 different Golf Courses located within 30km from the property. The closest is the 18 holes Golf Club “des isles Borromees” which is at only 5km. “Golf Alpino di Stresa” is next, with 9 holes at 10km. Next is “Golf & Sporting Club Verbania” - a 9 holes course at 15km and 5 more including Golf Club “Piandisole” in Premeno (VB), Golf Club “Castelconturbia” in Agrate Conturbia (NO) and Golf & Sport Club “Mera” in Scopello (VC). We generally rent weekly. with check-in on saturday at 4:00 P.M. and check-out the next saturday by 10:00 A.M., for different arrangements please ask. A final Cleaning Fee of 100.00€ will apply.